Posted February 1, 2019 by Brittany Schlacter & filed under Places to Go. There’s no shortage of winter fun all February long. Whether you’re planning a trip with your sweetheart in honor of Valentine’s Day or just avoiding cabin fever with your kids, there’s something for everyone’s calendar. Need a fun Valentine’s Day date idea? 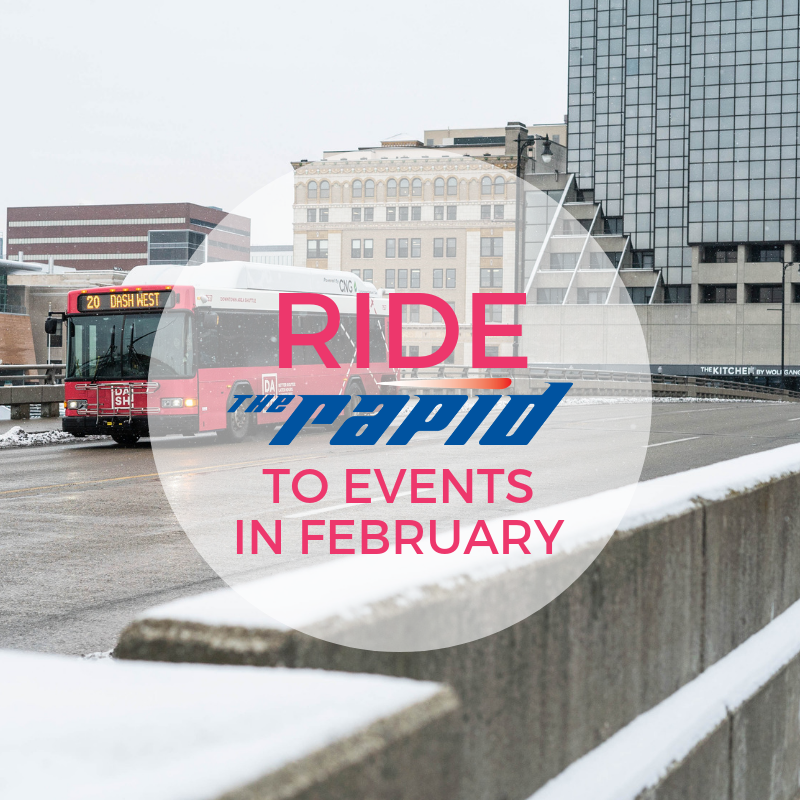 Hop a ride over to the Downtown Market on Thursday, Feb. 14 at 4 p.m. You can enjoy frozen tundra yard games and frosty tropical cocktails from the Ice Bar. The Silver Line can get you within steps of DeVos Place for the coolest display of cars and trucks this year. The Auto Show runs from Jan. 31 – Feb. 3. Tickets are $12 for adults and $5 for children. Spend your lunch break with live music and food trucks! This event includes free ice skating, foosball and ice games. This is just one of many events that make up the World of Winter Festival running from Feb. 14 – Feb. 17. Are you a Beer City Brewsader? Enjoy a month of specials at various craft breweries in GR. Beer Month takes place Feb. 15 – Mar. 15. Plenty of time to grab a pint and enjoy! Take a ride to Grand Rapids Civic Theatre for this ultimate feel-good show. This musical is showing Feb. 22 – 24, 27 – 28 and Mar. 1 – 3, 6 – 10 and 13 – 17. You won’t want to miss it. Celebrate African American history and culture at Grand Rapids Public Library. Free food samples, live music, and family crafts will be available as well. The event is on Feb. 17 from 1 p.m. – 4:30 p.m.
You can catch two of the showings on Feb. 10 and Feb. 24 for free at the UICA. The event is free and open to the public. The Grand Rapids Art Museum is hosting activist and scholar, Dylan Miner to talk about his GRAM exhibition Water is Sacred // Trees are Relative. Enjoy this free discussion about the Great Lakes watershed and region on Feb. 21 from 7 p.m. – 8 p.m.
On Feb. 28, take your family to Van Andel Arena for a night of Disney magic and your favorite Frozen characters. Ticket prices vary.